The weekend is over and you feel like you could enjoy one more day of casual dressing. Unfortunately, if you have to be at the office on Monday morning, that wish may not come true due to having to dress according to your work. That being said, there are ways to introduce casual garments, such as jeans, to your work wardrobe, assuming that denim is permitted in your office dress code. I've noticed that most people wear jeans to work for casual Fridays as an anticipation of the upcoming weekend. In my opinion, you don't have to limit yourself to enjoy your jeans at work only on Fridays; this can be done on any other business day. 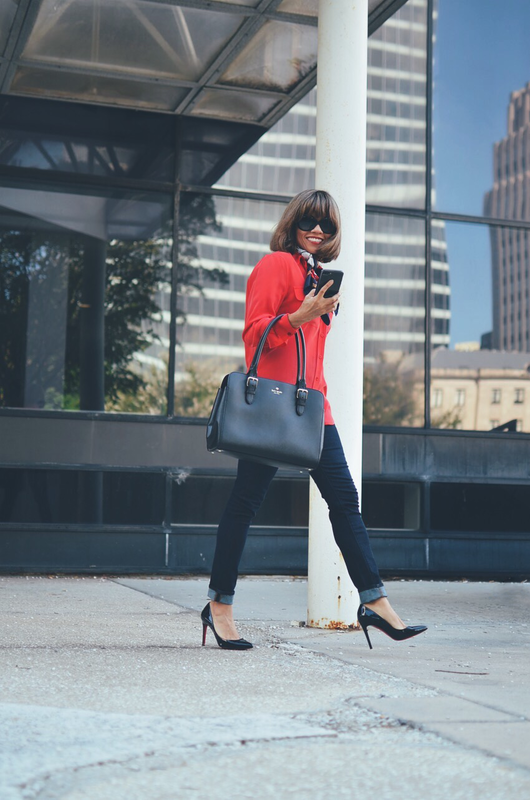 1- When it comes to wearing jeans at work, regardless of the cut, the darker the wash, the better. Embracing simple denim styles is a must when trying to achieve a work-appropriate look. Stay completely away from distressed jeans, especially the ones with holes. Reserve those for the weekend or your day off. 2- For an instant feminine and dressy touch, pair your denim with garments made of luxurious fabrics such as silk and cashmere. 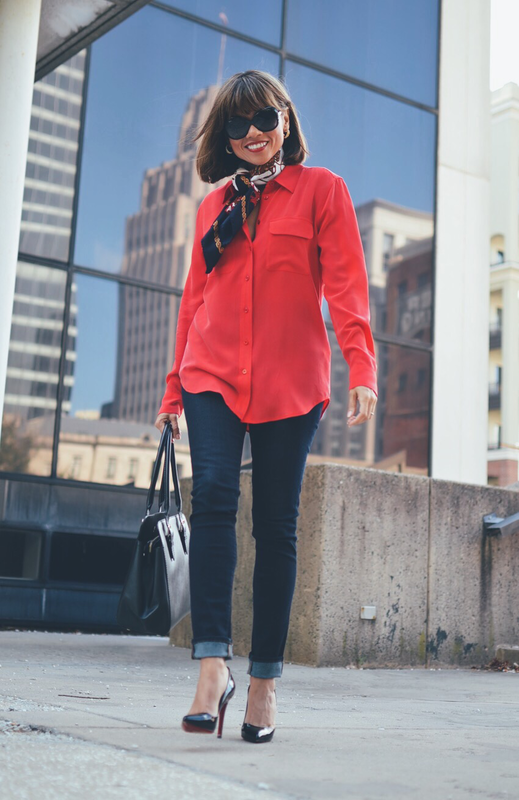 As you can see, I wore my dark denim jeans with a silk blouse (see more looks with this blouse here and here) that, besides adding a sophisticated touch to my jeans, it brought a great pop color. 3. Consider wearing a blazer or even a cardigan with your jeans, however, in 90-degree weather, I can understand if you want to skip this garment, as I did in this photo-shoot. 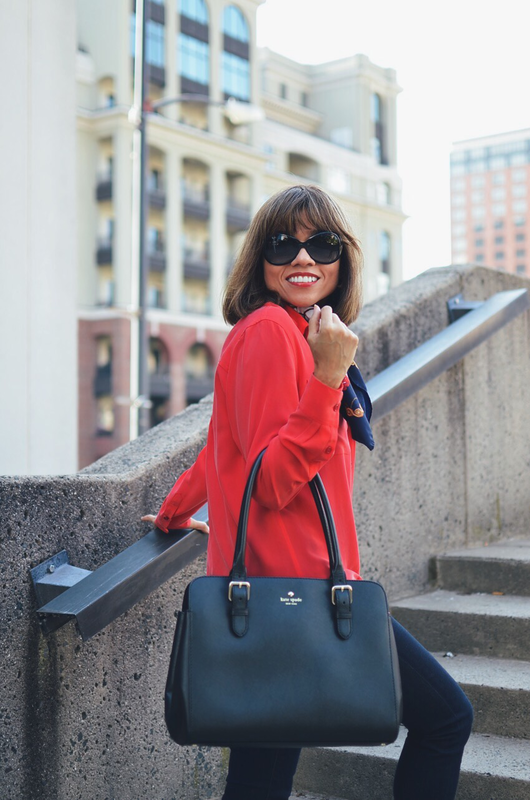 Jeans: J Brand and similar/Blouse: Equipment/Shoes: Christian Louboutin and similar/Scarf: Similar/Bag: Kate Spade. New style/Sunglasses: Ray-Ban. 4. 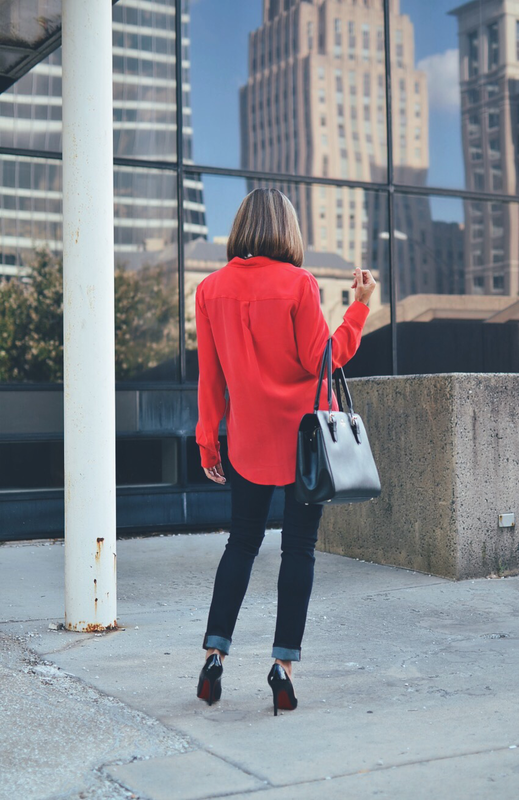 Tucking in your top has always been a quick way to make your jeans look dressier, however, if you wear a nicely tailored blouse, you can get away with leaving it untucked. Always remember to wear your garments in a way that makes you feel most confident. 5. 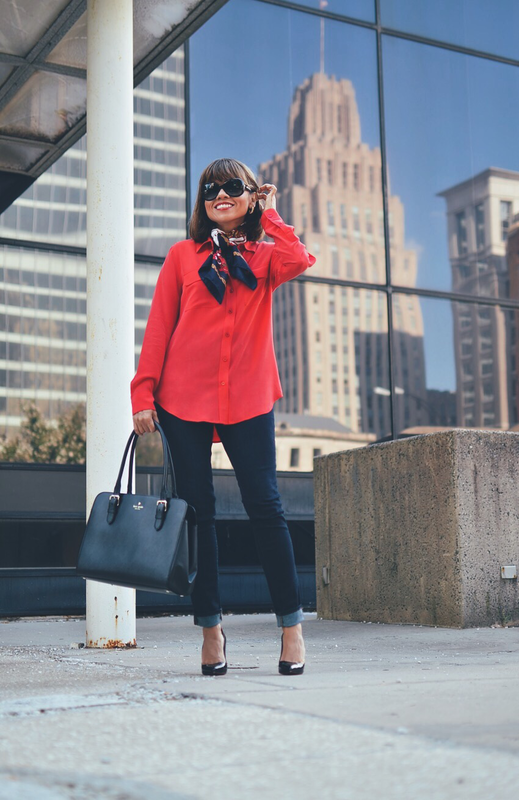 Wearing fabulous but classic heels have always been my favorite way to dress up my jeans. You don't have to wear a 4-inch heel in order to feel dressy. There are wonderful choices nowadays of shoes with a medium or kitten heel. If heels aren't your cup of tea, then I would recommend wearing your jeans with classic flats, such as a ballet or pointy toe. 6- And, last but not least, try to glam up your denim a little with some fun accessories. 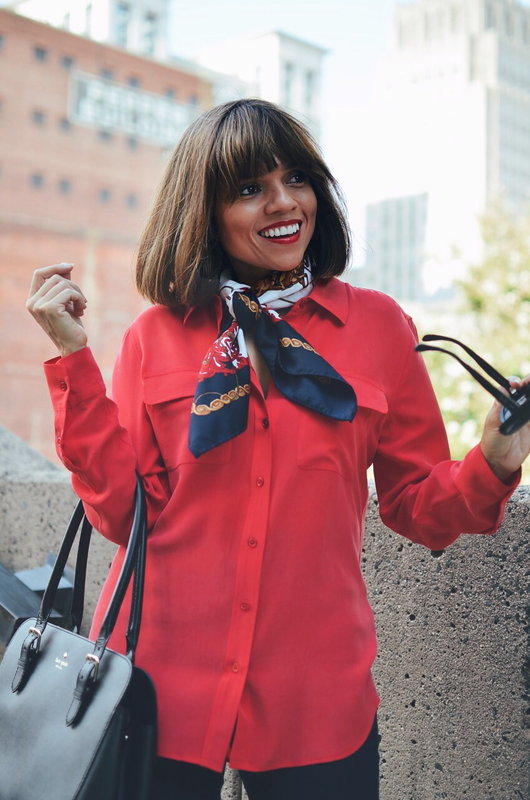 You can consider a nice silk scarf, an oversized brooch or statement earrings. Earlier in the month, I started a new tag named "Monday Work Outfits". 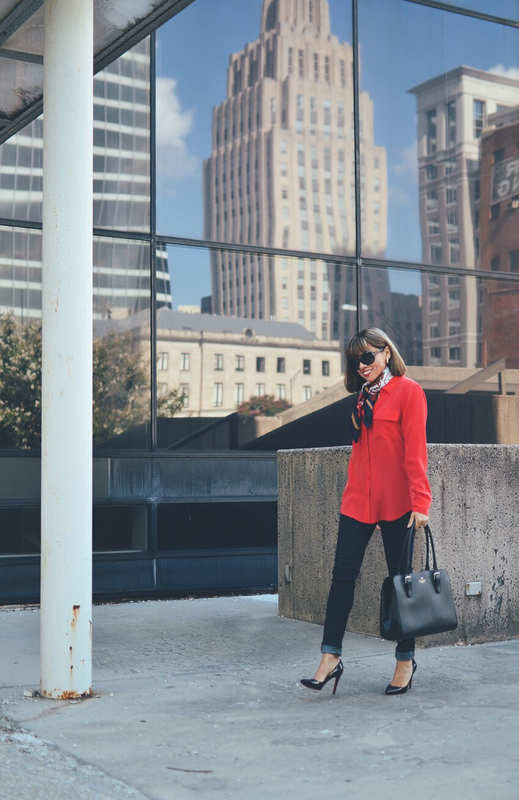 If you want to have a quick access to the looks under this tag, just go the top of this blog and find it inside the "Outfits" tab. I will try my best to post a couple of work-appropriate looks per month. I hope you can find them useful.